It was precisely 101 years ago yesterday when Leopold Bloom conducted his famous perambulation around the capital. And, as recorded in 'Ulysses', along his wandering walk on June 16, 1904 he passed an advertisement for a store which - like all celebrated characters - traded under a single name. "Mr Bloom stood at the corner, his eyes wandering over the multi-coloured hoardings. Cantrell and Cochrane Ginger Ale (Aromatic). Clerys' Summer Sale," wrote James Joyce. 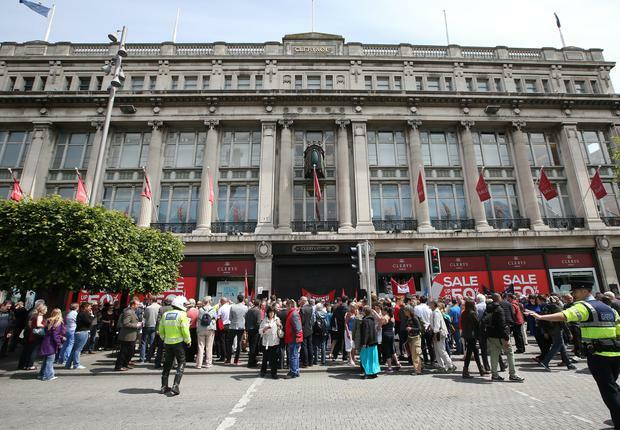 Over a century later, and Clerys' window is festooned with big red and white Summer Sale banners. But the doors are closed, the shutters rolled down, over 400 workers bundled out onto the broad thoroughfare of O'Connell Street with not a modicum of either decency or respect. But the workers returned yesterday, gathered under Clerys' Clock to protest against the method and manner of their brutal dismissal last Friday. For unlike so many department stores, many Clerys' staff didn't just come and go casually, treating the job as a temporary arrangement. Some had put in four decades, others three or two. Families took up employment there. More recently, workers who set up concessions in the store, plunged life savings into their business - it was Clerys, after all. Retail blue chip for over 150 years. Maurice Bracken from Terenure had worked in payroll for 32 years. "I feel so betrayed," he said. "I'm proud of my work record - in those 32 years I've only ever missed nine days because I've been in hospital or at the doctors." Maurice explained that he had been in Nepal during the devastating earthquake in April. "It was the most terrifying experience, and now it feels like the ground has gone from beneath me again." There were many emotions bubbling through the couple of hundred workers and supporters clustered under the clock, among them a mix of anger, shock, sadness, fear and disbelief. Gerry Markey, who worked at the store for 34 years, couldn't contain his anger as he addressed the crowd. "We deserve respect - how dare they treat us like that - this building is part of our history, our heritage, it's our home," he shouted, raising his arms in an unconscious echo of the statue of Jim Larkin opposite the main entrance to Clerys. Tour buses, double-decker buses, cars and taxis beeped in solidarity as they passed the protest, a cacophonous backdrop to the sad stories being shared by workers. Waving a banner together were mother and son, Maureen and Eoin Deans who had both worked in Clerys. "I had to ring Eoin and tell him he had no job," said Maureen. "I was absolutely happy working there. We looked after the customers, and now the taxpayers will be forced to pay our redundancy." Several politicians turned up to offer support. Fianna Fáil leader Micheál Martin deplored the treatment of the staff as "shocking - ethically and morally wrong. It's part of a trend of undermining workers, and the worst example of vulture capitalism." Dubliner Brian Murphy, dressed in the bow-tie and straw hat uniform of Bloomsday, had arrived from a Joyce reading to offer his support and said how one of the long-serving staff had just recounted a story of one December 8, the day when the Christmas shoppers from the country would descend on the store, and a queue would snake around the building. Brian explained: "One of the staff was acting as security and stopped a man trying to skip the queue. It was Mr Guiney (who owned Clerys for decades), but the worker didn't recognise him. 'But I'm Mr Guiney,' he proclaimed. However, the lad was unimpressed. 'That's funny, because there's already three of ye inside'." Joyce would've loved that tale from Clerys, at the heart of the 'rowl' since Bloom's day.